Ricardo Alcoser is mildly hopeful that Belize may have crossed a tipping point this year. The Field Executive Officer of the Scout Association of Belize, Alcoser is also the coordinator of the nation’s annual coastal (and now inland waterways) clean-up effort. And he is hoping that despite a huge increase in the number of groups, persons, and miles of coastline and banks cleaned, when the final tally is arrived at, the effort would have yielded less garbage in quantum. If that should indeed prove to be the case, then it could signal that in terms of Belize’s environmental conservation efforts we may have turned a corner, or a bend in the river of our consciousness. 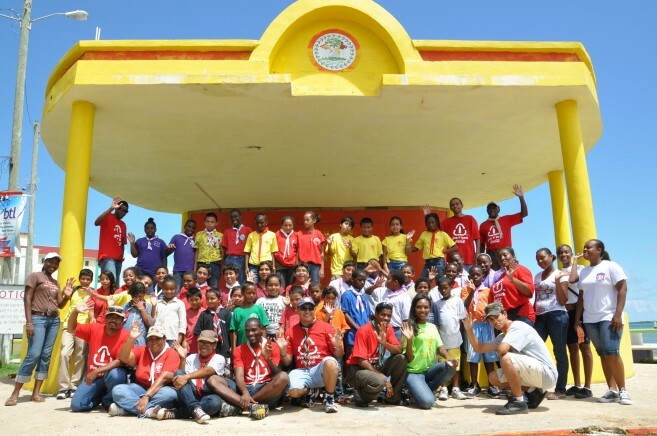 For the last 21 years the Scouts Association has spearheaded the annual exercise to clean-up a relatively speaking small portion of Belize’s hundreds of miles of coastlines and the banks of its waterways. At times it must have felt futile and even discouraging. It is only Alcoser’s third year at the helm of what is truly a gigantic task, but there’s that small glimmer of hope and perhaps reason for optimism. Last year 598 volunteers collected 7,769 pounds of garbage in 436 bags from 12.72 miles of Belize’s coastline and waterway banks. Last Saturday approximately 1,000 Belizeans equipped with 1,000 garbage bags cleaned beaches and the banks of waterways in Corozal, Ambergris Caye, Caye Caulker, St. George’s Caye, Orange Walk, Belize City, Placencia, Punta Gorda, Burrell Boom, San Ignacio/Santa Elena and Belmopan City, as well as along a mile of the newly re-named Philip Goldson Highway where it is bordered by the Belize River. It will take Alcoser at least three weeks to meticulously transcribe and collate the information from the “Summary Cards” the various groups filled out, but the early reports are encouraging. And even if the amount of waste collected does exceed last year’s total, neither he nor the many willing hands who gave sweat equity to the cause of a cleaner Belize will be disappointed. The positive takeaways are simply too many and far out weigh the inescapable conclusion that we continue to so persistently disrespect Mother Nature. Some of this year’s take will be recycled for re-use, by some of the brave young scout troops, a small virtual army of mostly primary school students. And then there’s the fact that this is a truly communal effort as a mélange of companies, non-governmental organizations and individuals from many areas of our society came together in common purpose for the social good. In an age of increasing polarization and division, do not under-estimate the power of “Ubuntu” that any national “Fajina” must engender. In Belize the Coca Cola Company joined its multinational partners in sponsoring the effort providing T-shirts, garbage bags and refreshments, and 15 members of its management staff cleaned a quarter mile stretch of the Belize City coastline. Their donation of time, kind, money and sweat was joined by organizations such as Oceana, Coastal Zone Management Authority and Institute, Department of the Environment, Toledo Institute for Development and Environment, Belize Audubon Society, Belize Tourism Board and Saint John’s College Junior College clubs (GECO and HOPE), the University of Belize, the various municipal governments, James Brodies, Augusto Quan, Caribbean Tobacco, Hofius, TIDE, and even our vary own San Pedro Sun as well as Scout troops and individuals. In Belize City the Belize Waste Control Limited carted all the garbage picked up to the landfill. Last year the most collected items were 5,186 individual caps/lids, 4,513 individual plastic bags and 3,915 individual cups, plates, forks, knives, spoons, and the collection list included almost every item we use for a total of 27,937 individual debris items. Alcoser does not expect this year to be any different in the variety of items but he is hopeful the tonnage will be less. Ocean Conservancy Networks list cigarettes, caps/lids, plastic bottles, plastic bags, food wrappers/containers, eating utensils (cups, plates, knives, forks, spoons), glass beverage bottles, straws/stirrers, beverage cans, and paper bags as the “top ten” most frequently discarded items. Last year Belize’s “Worst Offenders” list was rounded out with 3,884 beverage bottles (plastic) 2 liters or less, 1,625 food wrappers/containers, 1,126 straws/stirrers, 1,061 glass beverage bottles, 1,001 clothing/shoes, 599 smoking related items (214 cigarettes/cigarette filters, 81 cigarette lighters, 305 cigar tips, 99 tobacco packaging/wrappers), 588 beverage cans, 381 toys, 193 pull tabs, 175 building materials’ items, and 157 balloons. The greatest effort yet in its 21st incarnation this year’s annual coastal and waterways clean-up may yield a historic less, but even if that does not prove to be the case the clean-up after the national celebration deserves to be celebrated.